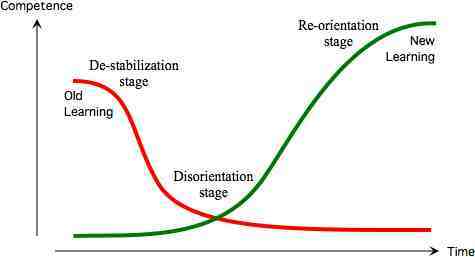 During the Re-orientation stage, the new learning "follows a similar pattern to the curve of normal additive learning". See Atherton J S (2013) Doceo; Learning as Loss 1 [On-line: UK] retrieved 22 February 2017 from his most important [adult] Resistance to Learning. If nothing else, the fact that Atherton's observation has never been taken into consideration by "developmental educators" in this country explains why, the mountain of stuff written about it notwithstanding, developmental mathematics education never got really off the ground and, in fact, seems now about to be abandoned. I don't know how I could have missed it but How do people "get" it? should be compulsory reading for anybody even remotely contemplating "teaching" mathematics. I am going to start thinking intensively about the unlearning issue, which, as far as I am concerned can mean only trying to document some admittedly anecdotal evidence. But this "evidence" will come from email exchanges I have had with my students so it may not be totally worthless, if only because it should point at some necessary experimentation. Reconsolidation theory proposes that retrieval can destabilize an existing memory trace, opening a time-dependent window during which that trace is amenable to modification. Support for the theory is largely drawn from nonhuman animal studies that use invasive pharmacological or electroconvulsive interventions to disrupt a putative postretrieval restabilization (“reconsolidation”) process. In human reconsolidation studies, however, it is often claimed that postretrieval new learning can be used as a means of “updating” or “rewriting” existing memory traces. This proposal warrants close scrutiny because the ability to modify information stored in the memory system has profound theoretical, clinical, and ethical implications. The present study aimed to replicate and extend a prominent 3-day motor-sequence learning study [Walker MP, Brakefield T, Hobson JA, Stickgold R (2003) Nature 425(6958):616–620] that is widely cited as a convincing demonstration of human reconsolidation. However, in four direct replication attempts (n = 64), we did not observe the critical impairment effect that has previously been taken to indicate disruption of an existing motor memory trace. In three additional conceptual replications (n = 48), we explored the broader validity of reconsolidation-updating theory by using a declarative recall task and sequences similar to phone numbers or computer passwords. Rather than inducing vulnerability to interference, memory retrieval appeared to aid the preservation of existing sequence knowledge relative to a no-retrieval control group. These findings suggest that memory retrieval followed by new learning does not reliably induce human memory updating via reconsolidation. Of course, I am not qualified to comment but I feel strongly that there is something here.